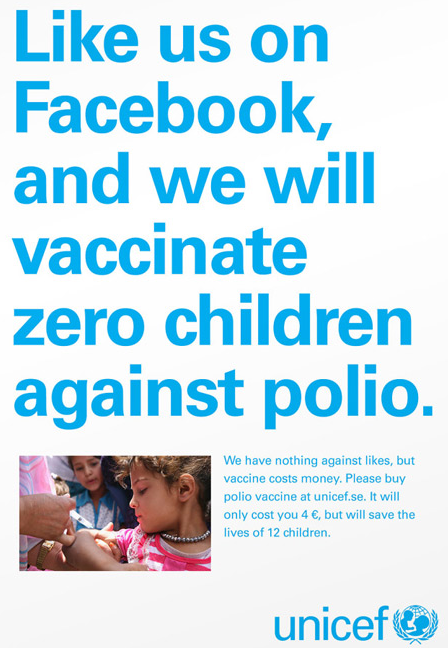 Unicef took a unique approach by posting a photo onto Facebook for their campaign “Likes Don’t Save Lives.” The picture catches you off guard and makes you read the sentence twice so you’re finally thinking about what the non-profit company is trying to say. I think the brand is proving a point that consumers are quick to move past a sad advertisement or announcement, so they are trying to reach those who have gotten into the repetition of moving through those without even looking. The ad itself is very bold and makes the consumer really think about what they are talking about. The brand is showing how easy it is to like something and at the same time they show how simple it is to donate. This makes sense for the brand because it gives their audience that extra push without being too emotional for this subject and gets to the point right away. I could see this resembling earned media more because of the shares on Facebook and other social media platforms.